God often uses the least likely person to accomplish his purposes. In Acts 9:15, God sends Ananias to commission Saul, a killer of believers, to carry the Good News of the Gospel. Like a guitar being played by one who is unskilled, Saul was making a lot of noise being used by the Devil. However, a divine encounter with the Master had him playing a different tune and fulfilling a far greater purpose. Left to our own devices, we can engage in many noise making activities but be out of tune with our life’s purpose . Surrendering to God puts us in perfect harmony with His will for our lives. Visit Internet Cafe Devotions for more posts filled with the Word this Wednesday. A goodd issue put ina wonderful way with words. Isn't this the truth! So much of the time I've tried to do it MY way (think Sinatra now). His ways are puzzling to us at times, but the song and dance much more amazing when surrendered to His writing! Wanda this was delightful. Thank you for sharing. Blessings. I absolutely loved your take on this scripture…my husband and I are in the music business, so I can really relate to this…great WFW! You know Wanda, this is AWESOME…all I want to be is harmony…I love this! It's one that will stay with me! reminds me of the chorus that says "let me dance to the beat of your heart"
I had a night some weeks ago where I listened to the Cohen song Hallelujah..it is on a CD of duets and is sung gloriously but I ended up weeping and weeping over the line that suggests that any Hallelujah will do……the sacred and the profane….I wept and wept for the blindness of our world. 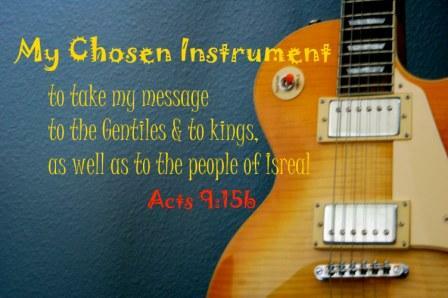 Chosen – to think the God of all chose us to be His instrument – wow! Amen! Let me be a vessel of honor, Lord. Beautiful Wanda. This really "pulls the strings" of my heart. 😉 Our 20 year old son is blessed to be gifted in music. I saw it since he was a baby and dedicated it for God's glory. He is now 20. He plays every instrument without lessons although years back we took him for formal lessons for a few years. He served in praise and worship ministries, but is not using his gifts for the Lord at this time–well, not the gift of music but others yes. This reminded me how he's a bit out of tune right now, BUT I KNOW IN WHOM I HAVE BELIEVED!!! Beautiful WFW and great reminder to not just "make noise!" I so want to have a heart that is in tune to what God has for me. Thank you for sharing your heart today. Oh Wanda – this is an AMAZING reminder and word picture. Gonna remember this for a long time. "Surrendering to God puts us in perfect harmony with His will for our lives"
thanks for re-inforcing a truth that god is driving home to me right now! What a wonderful word picture to help me remember God's desire for me to be in perfect harmony with His will for my life. I love this, Wanda! Amen…thanks for speaking a good word to me today! Smiles…and have a great week! A beautiful graphic for the verse. May I always be an instrument in perfect harmony that He can use. thanks for sharing that — so often the world wants us to "march to our own drum" and be "independent"! However, as you've written, truly, our goal is to be in the band with God allowing Him to use us to make a beautiful symphony. Aww, so great! Love the picture with the verse and the play on words…super WFW! Great word for this Wednesday! Yes, a great scripture and picture – to be in harmony with God. I'm reading Rick Warren's Purpose Filled Life, a 40 day devotional book, along with my oldest daughter. Today's devotion taught me how to have God as a friend. It was the most amazing experience I've had in a while. I tried what Rick wrote and it works. Thanks for sharing and visiting my blog as well. Ooohhh this is so good. I'm reminded of the verse in 1 Corinthians about a clanging cymbal. Used in the right way, the cymbal enriches music. By itself, and without the right rhythm, it is annoying. oh! a perfect verse for me today! thanks! Great analogy! Thanks for sharing. God bless. Wonderful object lesson. Very well said! I enjoyed this post. I absolutely love this WFW, sometimes I forget to surrender to God and be His instrument. This is our purpose, to be in tune with His calling. Oh, AMEN! What a beautiful post and reminder, Wanda!!! Thank you for that! Wonderful WFW ! Great verse & illustration !